Even before considering new ventilation equipment, you can control air quality to a surprising degree with fairly simple actions. Eliminating or reducing the source of the pollutant is almost always easier than capturing the pollutants after they have been released in the house. Banning indoor smoking is a clear example. Here are some other major ones. Consider sealed combustion heating appliances. Combustion products from space or water heating appliances should never mix with the indoor environment. 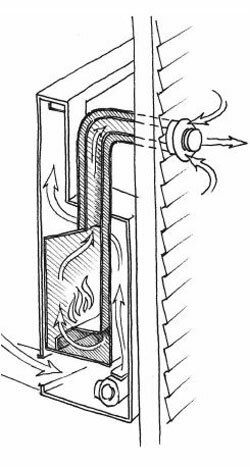 The terms sealed combustion, direct-vent, and power-vented appliances all refer to appliances that vent their combustion products to the outside through a sealed pipe, under positive pressure. Sealed-combustion appliances are widely available and should always be used whenever the unit is located inside the conditioned space. Check the garage connection. If your house has an attached garage, hire a professional to make sure the connection between your garage and your living space (including rooms above the garage) is airtight to prevent car exhaust and other chemicals you may keep in your garage from entering your house. Control moisture. In many houses, construction and/or maintenance mistakes help water enter the house to make mischief. The most common and easily corrected errors come from improperly disposing of water shed from the roof. First, make sure that rain gutters drain away from the building, not toward the basement or foundation (slab) walls. Grade the ground so it slopes away from the house. Water that collects near the foundation is very likely to leak in, at least during heavy rains. In southern climates in particular, dehumidifiers may be necessary to control moisture levels in the house, if the air outside is hot and humid. If condensation is a problem, pay attention to how you ventilate areas that exchange a lot of air with the outside or produce a lot of moisture. Clearly activities that produce a lot of steam, like showers, should be vented directly to the outside. Other scenarios are less obvious. For instance, ventilating a basement in the summer will pull hot humid air inside, causing condensation on the cold interior wall. Similarly, if your attic is vented, condensation may develop on the underside of your roof when the temperature drops at night, particularly if there is a source of warm moist air in the attic, either from excessive air leakage through the ceiling or heating equipment located in the attic. During the winter, this could lead to massive icicles forming along the roof edge. If it’s cold outside and there’s a break in insulation, warm moist air from inside will condense along that cold seam, especially in rooms that contain plants or appliances that generate water vapor. Read up on how to make sure these areas of your house are well sealed and insulated in the building envelope section. Use safe household products. Use pesticides and cleaning agents wisely and store them safely. Choose low-VOC paints and building materials and finishes that are known to reduce pollutant emissions. If you can’t control the pollutant source, then exhaust it from the building where it is produced. It takes a lot less energy to remove a small amount of moisture-laden bathroom or kitchen air than a larger volume of air from the whole house. When showering or cooking, use an exhaust fan to exhaust pollutants directly to the outdoors before they can negatively impact air quality in other rooms. Typically, this can be done with individual exhaust fans in bathrooms and a vent hood over the kitchen stove. Opening a window may not be enough to clear the air of moisture and other pollutants, especially on warm, calm, or humid days. If you are looking to install a new exhaust fan, look for an ENERGY STAR-qualified fan. ENERGY STAR fans are energy efficient, provide the right airflow, and are also quiet — about as loud as a modern refrigerator. To provide the right ventilation without wasting energy, fans should be 50 cfm for bathrooms 100 ft2 or less. Kitchen range hoods are available in many sizes, but typically an up-draft range hood should provide 100 cfm of ventilation for wall-mounted hoods and 150 cfm for island hoods. They should always have a ducted passage to the outside that is fitted with a damper to prevent infiltration. If you have a bathroom fan but you are concerned about forgetting to use it or leaving it on too long, you may want to consider hiring an electrician to install an occupancy sensor, humidity sensor, or other controls that turn the fan on with the light switch. In addition to removing various gases by the methods discussed above, you may also have to deal with particulates such as soot, dust, pollen, and tobacco smoke. These pollutants cannot be handled with exhaust alone, just as filters don’t do the best job of removing gases. Mechanical systems that circulate and filter air through the house are the best approach. Mechanical filters. There are two basic kinds of air filters. Mechanical filters trap particles on the surfaces of porous “media” that act like three-dimensional sieves. The designs vary in shape and the size of the smallest particles they trap well, as measured by “MERV,” or “Minimum Efficiency Report Value.” MERV 4 or 5 is pretty characteristic of residential air filters. MERV 8 or 9 will do a good job on particles down to about 3 microns in size. A fraction of fine smoke and bacteria will even pass through these. MERV 12 is probably higher than needed for any residential use other than for very specialized clinical needs. In general, mechanical filters that remove finer particles cost more to purchase and have substantially higher resistance to airflow; they require more fan electricity. This may amount to hundreds of kilowatt hours per year, or over $100 in some regions. Electrostatic filters. “Electronic,” “electrostatic,” and “electret” air filters use a different physical principle: particles passing through these assemblies are attracted to surfaces that have an electric charge. They are trapped there until the filter is cleaned or discarded. In contrast to mechanical filters, these usually pose little resistance to airflow. However, “permanent” types do require regular cleaning to maintain their performance. All forced-air systems need filters, and all filters need regular cleaning or replacement. The first thing is to be sure that you know where your filter is. 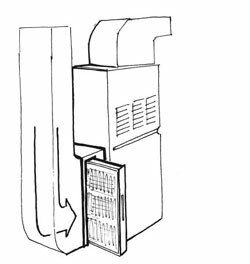 Usually, it is in a slot, often protected by a door, near the connection between the return air and the air handler for the furnace or heat pump. Many attic-based systems will have their filters installed in return air registers, instead, for easier access. This may mean multiple filters, one for each return. Most filters are disposable, with expected lives of a month, several months, or a year. Dirty and clogged air filters require much more fan energy, and may lead to inadequate air delivery, or shorten the life of expensive components. After local exhaust is applied to remove concentrated pollutants at their source and any particulates are filtered from the air, it is recommended that houses always have some planned ventilation strategy that dilutes the general body of lingering pollutants by mixing stale air with new air and moving it through the house. This can be continuous or periodic, and it may be achieved simply by opening windows. Throughout the day, or if there isn’t much breeze, operating a 100 cfm fan would continuously provide adequate ventilation for a 1,500 square foot house with 8-foot ceilings. The same result could be obtained with several smaller fans in different rooms, or with a larger fan that ran intermittently. Use sealed combustion to control air intake and exhaust in a fuel-burning appliance. 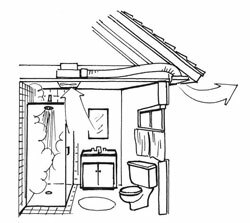 Choose a quiet, energyefficient exhaust fan for your bathroom to remove pollutants such as VOCs and water vapor. Replace furnace air filter monthly during the heating season.